If you thought this past week was busy in terms of the weather, we have another week of potentially active weather coming up. Let's start with tonight. 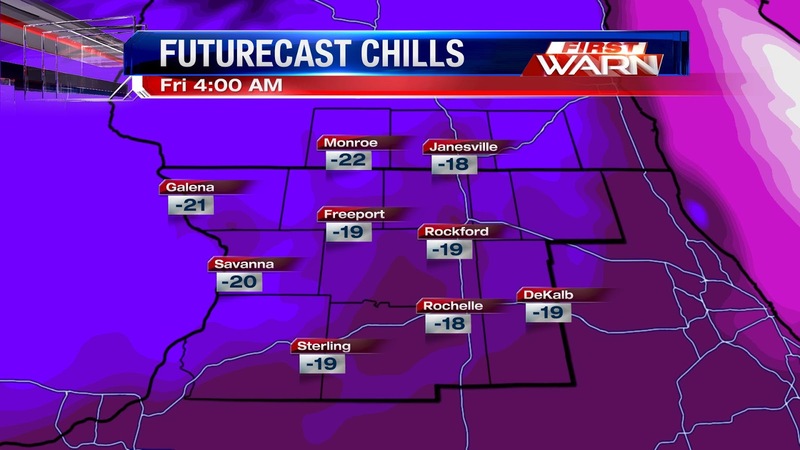 A Wind Chill Advisory remains in effect for the entire Stateline Thursday night. 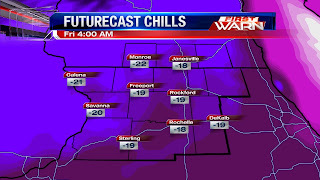 Wind chills are expected to dip to 20-25° below zero as actual temps chill to a few degrees below zero. Starting Friday night, we'll see a series of low pressure systems roll through the Stateline. All of them will bring the threat of precip... most of it being in the form of snow. The official 7-Day has 1-2" of snow possible Friday night into Saturday. Similar low-impact snow events could also happen Monday and Tuesday with the chance of a rain/snow mix by next Thursday. Stay tuned for updates on the forecast, especially next week! A Wind Chill Advisory has been issued for all of northern Illinois and southern Wisconsin. It begins at 4pm for Jo Daviess, Stephenson, Carroll and Whiteside counties and at midnight for the remainder of the viewing area. High pressure moves in tonight which will allow skies to clear with wind chills potentially dropping to -20° by Friday morning. Here's a look at preliminary snow totals from across the Stateline. As of the time of this posting, it was still snowing a little bit, so these totals could change. If you have your own snow totals you'd like to add to the list, you can e-mail us at weather@wtvo.com. Thanks! Mount Carroll (Carroll) - 3.0"
Rockford Airport (Winnebago) - 1.0"
Tony Honchar – Freeport (Stephenson) – 2.8"
Jason Rowl - Forreston (Ogle) - About 4.0"
2:15 pm Update: A second band of snow has developed and will continue to move through the remainder of the afternoon. Temperatures are slightly cooler than what they were early this morning so we may be able to fluff up an additional inch or two. Roads may become slick tonight once the temperature drops, especially with some of the slush we now have around. Take it easy if you're out this evening or early tomorrow morning. (1:28:20 PM) nwsbot: Local Storm Report by NWS MKX: Edgerton [Rock Co, WI] trained spotter reports SNOW of M4.8 INCH at 01:22 PM CST -- storm total so far. snow covered roads. (1:55:01 PM) nwsbot: Local Storm Report by NWS MKX: Milton [Rock Co, WI] public reports SNOW of E4.0 INCH at 01:48 PM CST -- storm total so far. relayed by broadcast media. (1:29:16 PM) nwsbot: Local Storm Report by NWS DVN: 6 SSE Council Hill [Jo Daviess Co, IL] trained spotter reports HEAVY SNOW of M5.0 INCH at 01:29 PM CST -- so far. (1:21:54 PM) nwsbot: Local Storm Report by NWS DVN: SSW Scales Mound [Jo Daviess Co, IL] trained spotter reports HEAVY SNOW of M6.5 INCH at 01:15 PM CST -- total so far. received another 2 inches since last report. still snowing. (1:25:32 PM) nwsbot: Local Storm Report by NWS LOT: 4 NW Rockford [Winnebago Co, IL] co-op observer reports SNOW of M1.3 INCH at 01:25 PM CST -- 1 inch on ground. water equivalent 0.28. With the exception of a few flurries, the snow has ended for the time being. There is a second band that has developed just west of the Mississippi River and will continue to rotate east through the afternoon. Additional snowfall totals will be small but temperatures should be at least right around 30°/upper 20s by the time this moves in. If this band holds together we may be able to fluff up another inch or two. (10:59:50 AM) nwsbot: Local Storm Report by NWS MKX: Edgerton [Rock Co, WI] trained spotter reports SNOW of M4.0 INCH at 10:35 AM CST -- storm total snow. 1.8 inches fell in the past hour. moderate snow currently falling. snow covered roads. 9:15 am Update: Snow is falling and sticking to roads west of Rockford in Monroe, Freeport and Forreston. 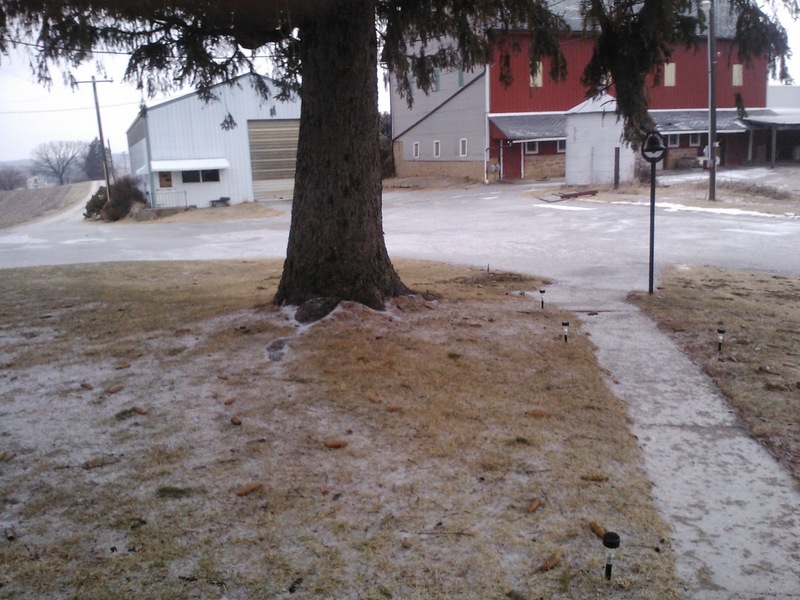 A mix of sleet/snow/rain is occurring in Rockford with rain still falling in Rochelle. If the transition hasn't occurred yet it soon will. I've received several reports of heavy snow falling in Freeport with traffic moving slowly on Rt. 26 through Cedarville. A mix of sleet and snow has already begun for Monroe, Freeport and Forreston early this morning as a second low pressure system moves just to the south of Rockford. Further north and west the snow has been falling where reports of 1" to 4" have already occurred back in Iowa. As this second low moves east of Chicago mid-morning the cold air will continue to move in changing any drizzle or a sleet/drizzle/snow mix over to all snow around 9am/10am. Once the snow starts to fall, it will increase in intensity through Noon before tapering off by 5pm. 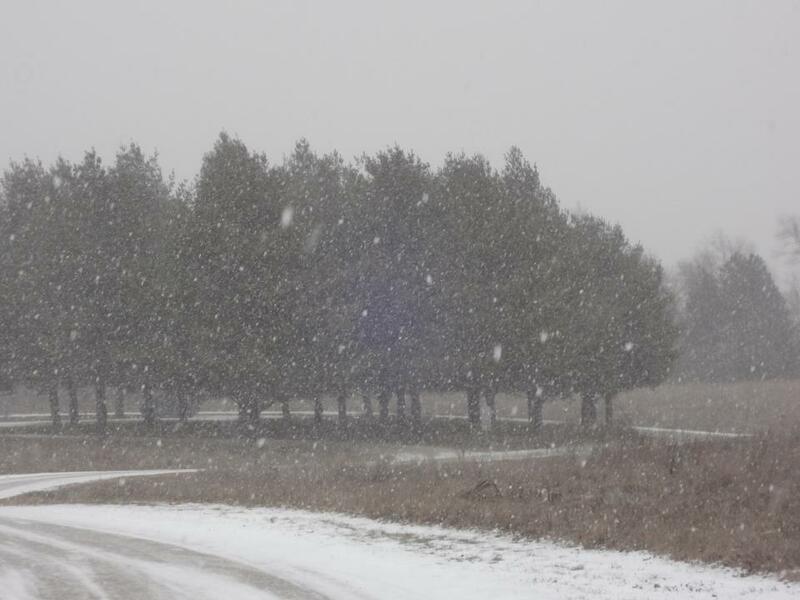 A heavy, wet snow will fall initial until the temperature drops below 32°. Winds will also increase as the snow occurs which will reduce visibility for a time late this morning and early afternoon. A Winter Weather Advisory has been issued for Rock and Walworth counties in Wisconsin and for Winnebago, Boone, Ogle and Whiteside counties in Illinois. A Winter Storm Warning has been issued for Green County in Wisconsin and for Stephenson, Jo Daviess and Carroll counties in Illinois. 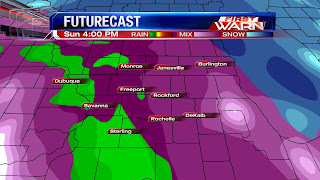 Locations north and west of Rockford will likely see the heaviest of the snowfall. So this puts locations west of a line from Monroe to Freeport to Mt. Carroll closer to 6". Areas east and southeast will receive less...generally 3"-6". Places like DeKalb, Sycamore, Genoa, Kingston, Paw Paw, Ashton and Franklin Grove may end up on the lower end as the heaviest snow band sets up just to the north and west. Since we had 60 degree weather and over an inch of rain yesterday the snow may melt initially on contact before accumulating. Also, a dry-slot has developed and is moving into western Illinois. This may cut back on snow totals for this afternoon. Something we'll watch fairly closely this morning! Record high temperatures, heavy rain and even a few thunderstorms have been the story of our Tuesday, but winter is back with a vengeance come Wednesday. 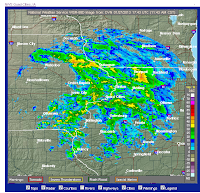 Radar and satellite just before 6:00pm Tuesday shows heavy rain still rolling through Illinois, with snow back into parts of Nebraska and Kansas. Rain won't switch over to snow until after midnight for the most western parts of the viewing area. Once the switchover begins, snow will begin to accumulate fast. Winter Storm Warnings and Winter Weather Advisories are set to kick in overnight and last through the day Wednesday for northwestern Illinois and southern Wisconsin. The main concerns Wednesday will be heavy snow and strong winds. Model runs are showing the heaviest snow to our northwest, with some areas receiving more than half a foot of accumulation by late Wednesday. 1-3" for southeastern parts of the viewing area. Winds gusts Wednesday will hit 30-35mph, causing blowing snow and reduced visibilities across the Stateline. 3:40pm Update: Copious amounts of moisture continue to move northeast from Missouri. Rain will continue through the remainder of the evening before switching to snow by Wednesday morning! (1:28:52 PM) nwsbot: Local Storm Report by NWS DVN: 4 WNW Dubuque [Dubuque Co, IA] trained spotter reports HEAVY RAIN of M0.97 INCH at 01:25 PM CST -- lots of standing water in the grass. 1:00 pm Update: The cold front is knocking on our doorstep early this afternoon. Temperatures ahead of the front have warmed into the upper 50s/low 60s while temperatures behind the front have dropped into the 30s and 40s. The leading edge of the rain is now moving into northwest Illinois with light rain being reported from Moline to Dubuque and even a little drizzle in Freeport. These showers will continue to move north/northeast throughout the remainder of the afternoon and evening with rain beginning in Rockford by 2pm. Heavy rainfall with totals between 1.5" and 2" will be the main concern later this afternoon and evening. A few of the embedded storms could produce some stronger wind gusts. 11:00 am Update: A Winter Storm Watch has now been extended to cover Stephenson, Carroll, Whiteside and Jo Daviess counties beginning at midnight night and lasting through 6pm Wednesday. An impressive weather event will begin to unfold this afternoon and evening as daily high temperature records are shattered and possibly even all-time January record highs! Let's first break down what's going to happen for the remainder of this morning. A very warm and moist atmosphere is in place and this has been the trigger for scattered storms early this morning. By this afternoon low pressure and a strong cold front will sweep through southern Wisconsin and northern Illinois bringing with it storms that are currently near Wichita, KS and Kansas City, MO. The Storm Prediction Center has extended the slight risk further north to include parts of Winnebago, Ogle, Lee, Whiteside, DeKalb and McHenry counties...along with most of northeast Illinois. The bulk of severe weather will occur to the south, mainly over Arkansas, later today but stronger storms aren't out of the question in northern Illinois. Skies will likely remain mostly cloudy limiting the amount of heating that will take place but with such strong winds within the jetstream and such a moisture rich atmosphere, some of that energy could get transferred down to the surface causing storms to produce damaging winds; an isolated tornado is possible as well but the risk remains low. Along with the threat for stronger storms, a greater threat today will be heavy rainfall. Aerial Flood Watches have been issued for Winnebago, Boone, McHenry, Ogle, Lee and DeKalb counties as rainfall totals could exceed two inches; especially if stronger storms move through. We'll be closely monitoring any storms that form after 3pm today. If heavy rain wasn't enough the potential for accumulating snow, especially west of Rockford, is becoming even more likely. The cold front has slowed down some which may delay the onset of cold air moving in overnight night and early Wednesday but from Monroe to Freeport to Mt. Carroll and points west accumulating snowfall of more than 6" will be possible by Wednesday night. In fact, Winter Storm Watches have been issued for Green County in southern Wisconsin and for Jo Daviess County in northwest Illinois beginning late tonight. If the axis of heaviest snow shifts further east then Rockford could be dealing with a winter storm by Wednesday afternoon! 8:00 am Update: Storms from this morning are beginning to wind down, however, there are a few more showers/storms developing in eastern Iowa that will be here around 10am. Stronger storms are possible from mid-afternoon to this evening as the main low pressure and cold front move through. ALL USERS OF THE KLOT WSR-88D ARE REMINDED THAT AFTER FRIDAYS SOFTWARE FAILURE THE KLOT WSR-88D IS OUT OF CALIBRATION AND RUNNING HOT. REFLECTIVITY VALUES APPEAR TO BE RUNNING 10 TO EVEN 15 DBZ TO HIGH. TECHNICIANS ARE AWARE OF THE PROBLEM AND WAITING FOR PARTS TO ARRIVE. IN THE MEANTIME...PLEASE USE CAUTION IN INTERPRETING REFLECTIVITY DATA. 6:35 am Update: Heavy rainfall moving through central and northern Boone County from Belvidere, Poplar Grove and Capron. Heavy rainfall and frequent lightning will occur with these storms as they move east. Further west, moderate to heavy rain will continue for the next hour or so. Nothing severe is expected at this time. (6:02:23 AM) nwsbot: Local Storm Report by NWS DVN: Mount Carroll [Carroll Co, IL] trained spotter reports HAIL of pea size (E0.25 INCH) at 05:40 AM CST -- delayed report. Thunderstorms late Monday night produced pea to nickel sized hail across northern Illinois and southern Wisconsin. Once the storms moved north, dense fog developed but within the past two hours visibility has improved in most locations. Scattered showers and storms will continue to move through the area this morning becoming a little more numerous through the afternoon and evening. Right now, rain with a few embedded thunderstorms are moving into Stephenson and Carroll counties from Freeport, Pearl City to Lanark and Milledgeville. Severe weather isn't expected with these storms but heavy rainfall will be likely. Spring-like temperatures will lead to spring-like thunderstorms Tuesday. A stationary boundary in place Monday will continue to sag south through northern Illinois this afternoon. Low pressure will develop in the Plains later tonight lifting the front back north as a warm front after midnight. Temperatures will rise overnight close to 50° by the time you wake up Tuesday. Showers and thunderstorms will also occur early Tuesday morning with heavy rainfall possible. We'll see a brief break in the storm activity during the afternoon but thunderstorms, some strong to severe, will redevelop as a strong cold front plows through the Midwest by Tuesday night. With such a large amount of moisture in place heavy rainfall will be the main threat for northern Illinois and southern Wisconsin. Totals may exceed three quarters of an inch to over an inch of rainfall by Tuesday night. While significant flooding isn't expected, some runoff may occur if soil temperatures remain below freezing. Right now soil temperatures between 4" and 8" deep remain between 29° and 31°. If totals exceed over an inch, which they may if thunderstorms move through, then flooding may become a bigger concern. Once the front passes Tuesday night temperatures will drop significantly with highs Wednesday only in the middle 20s. Rising temperatures and dew points overnight have caused locally dense fog to form early this morning with a Dense Fog Advisory for Green and Rock Counties in southern Wisconsin until Noon today. Fog will be present throughout the majority of today, tonight and Tuesday until a strong cold front moves through late Tuesday night. Temperatures today will remain in the middle 40s and rise overnight as a warm front moves closer to northern Illinois. Drizzle and scattered showers will be seen from time to time this afternoon with the potential for heavier rain and thunderstorms, yes thunderstorms, developing after midnight tonight. Scattered thunderstorms will be likely Tuesday with near record warmth. Highs Tuesday will rise close to 56°! The record high for tomorrow is 55° which was set back in 1914! Here are some viewer photos sent in showing Sunday's icy conditions as they move through the Stateline. 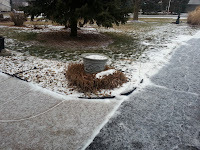 Noon update: A mixture of sleet, freezing rain and even snow has moved into northern Illinois and southern Wisconsin. What looks like heavier rain or even possibly thunderstorms on the radar (yellow and orange colors) is what we call 'bright banding'. This is usually an indication of sleet and or freezing rain as the radar beam reflects differently from the precipitation. Looking at current surface temperatures and we're rising close to 30° as the precip continues to move in. Sunday 7:30am Update: A Freezing Rain Advisory is now in place across all northern Illinois counties. This replaces the Winter Storm Watch from Saturday evening. 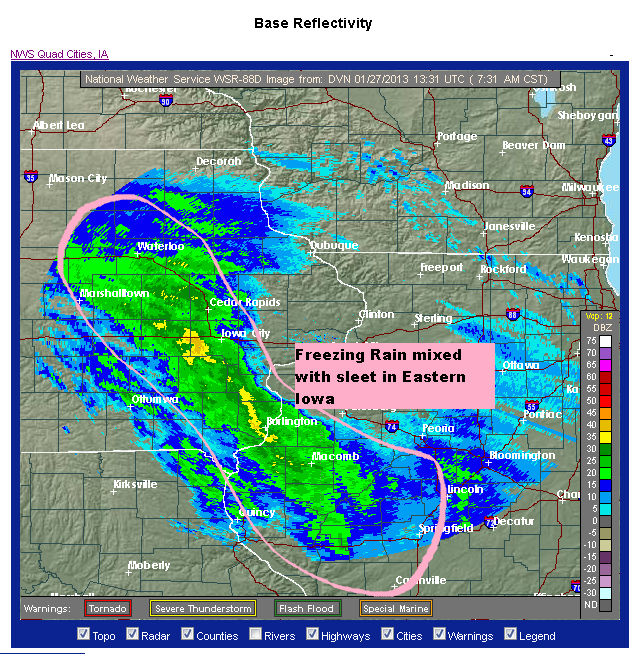 Freezing rain, mixed with sleet at times, has been falling in eastern Iowa from Burlington to Cedar Rapids. 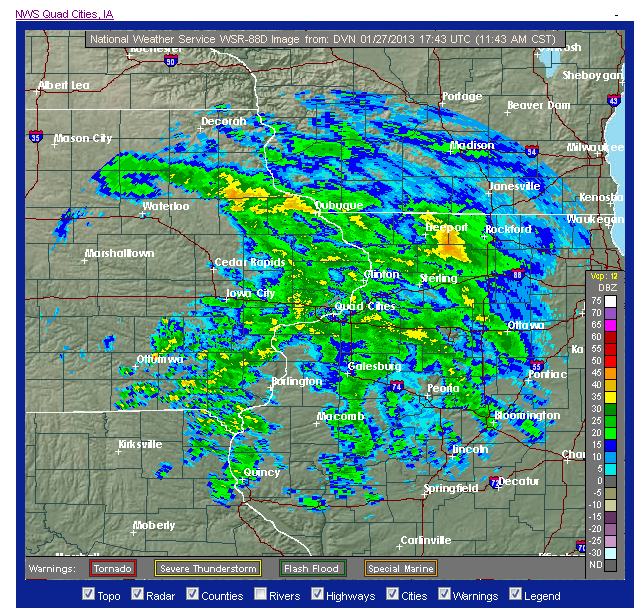 Current radar trends suggests the leading edge of the precipitation crossing the Mississippi River after 9am and spreading across northern Illinois and southern Wisconsin after 10am. Temperatures now are in the upper 20s but where the sleet and freezing rain are occuring temperatures are in the 30°-32° range. It still looks like a 0.10" up to 0.20" of ice accumulation is still possible. Travel is not advised this afternoon. 9:45 pm Update: From what has come in of the evening model runs, the going forecast looks pretty much the same. Temperatures tonight will hold steady in the low to mid 20s. Of interesting note the NAM model has come in with slightly higher QPF (total precipitation amount) totals by Sunday night. If temperatures do in fact remain below freezing throughout Sunday afternoon ice accumulations closer to a quarter of an inch, or more, will be likely causing significant icing problems. Winds will increase as well so it's possible power outages may occur if ice builds up on power lines and tree branches. A Winter Storm Watch (counties in blue) has been issued for northern Illinois beginning Sunday morning and a Winter Weather Advisory (counties in brown) has been issued for Green, Rock and Walworth counties beginning Sunday morning. An icy Sunday is possible as low pressure currently in the southwest moves northeast late tonight. As it does, southerly winds will increase by morning warming temperatures just a few thousand feet above the surface close to 40°. Meanwhile, temperatures at the surface will start in the 20's and rise to roughly 30° by early afternoon. This setup within the atmosphere poses the risk for sleet but also freezing rain; especially if temperatures at the surface remain below freezing throughout the day - and that's the million dollar question! Just how long will surface temperatures remain below 32°??? If temperatures warm sooner than anticipated then the threat for ice accumulation will be significantly reduced. 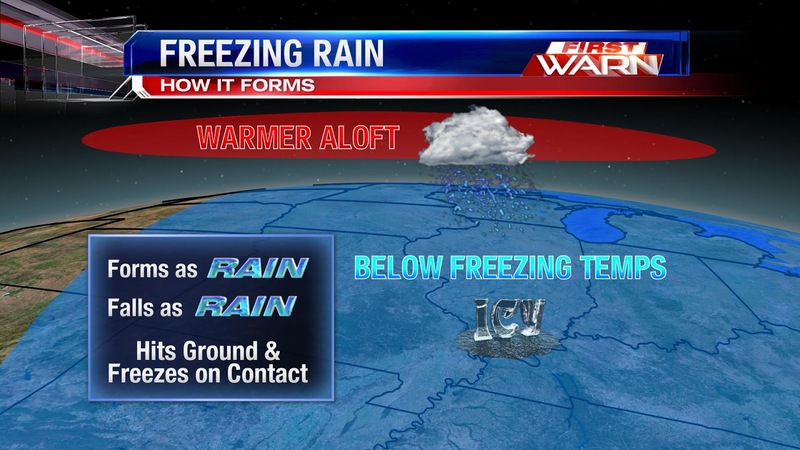 If temperatures are slow to warm then ice accumulations near a quarter of an inch will be likely. The atmosphere Saturday night and early Sunday morning will likely be too dry to allow for anything falling from the clouds to reach the surface. However, after about 10 am is when the precipitation will begin to move in from the west. Initially, it should begin as a mixture of snow and sleet with maybe a little freezing rain. It looks like the warm layer aloft in the morning may not be deep enough to allow for complete melting to take place. Southeast winds will increase due to high pressure over the Ohio River Valley. It's important to note that temperatures in that region this afternoon were in the upper 20s and low 30s and this is the source of where our air mass will be coming from Sunday. After about Noon it appears as if the invasion of warm air aloft will become fairly significant while temperatures at the surface sit between 30° and 32°. This is when we could see the wintry mix transition to more of a freezing rain scenario. Temperatures at the surface look to stay either right at or slightly below freezing until after about 6pm/7pm Sunday evening. As the temperature warms Sunday night any freezing rain would then switch to just rain. Again, the big question Saturday night is just how fast, or slow, surface temperatures will warm above that magic 32° mark. Right now, total ice accumulations look to be anywhere from 0.10" to 0.20". If temperatures warm sooner then those ice totals will be reduced. (Let's hope that's the case). Subtle changes in the atmosphere will be major players for Sunday's weather. Keep checking back for the all the latest updates, but to be on the safe side try to have any last minute errands finished by tonight. 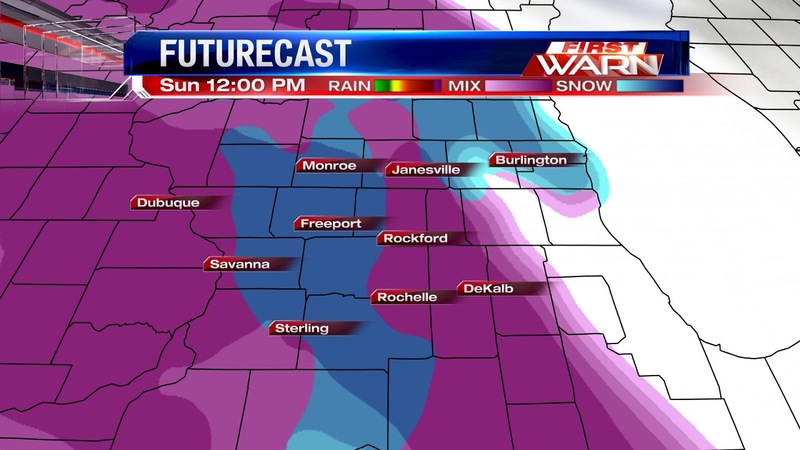 While the start of this weekend should stay fairly quiet, Sunday is going to bring a slew of winter weather problems. Namely, freezing rain. 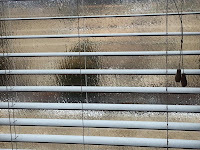 First, let's explain how freezing rain works. When air in the upper levels of the atmosphere is above freezing, precipitation takes the form of rain. If temperatures at the ground are below zero, that rain will freeze when it lands. Sunday Morning: Freezing rain could move in as early as the morning, but models are suggesting our wintry precip moves in midday. It could still be cold enough in the upper parts of the atmosphere that some snow and sleet could mix in. 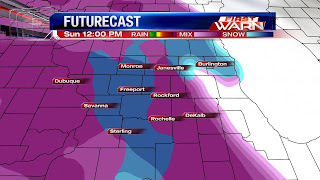 That's the blue mixing in with the purple on our Futurecast. 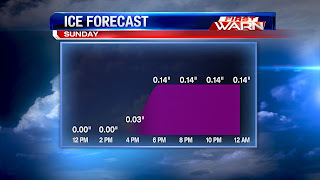 Sunday Afternoon: Freezing rain continues, but as temperatures warm near the freezing mark, we could see a few patches of just rain mixing in. Sunday Night: Temps will continue to warm overnight, so any rain that is left will not be of the freezing variety, although accumulating ice is expected. Models are suggesting a few tenths of an inch of ice by Sunday evening. If this forecast holds, roads are going to be slick and dangerous in many spots. 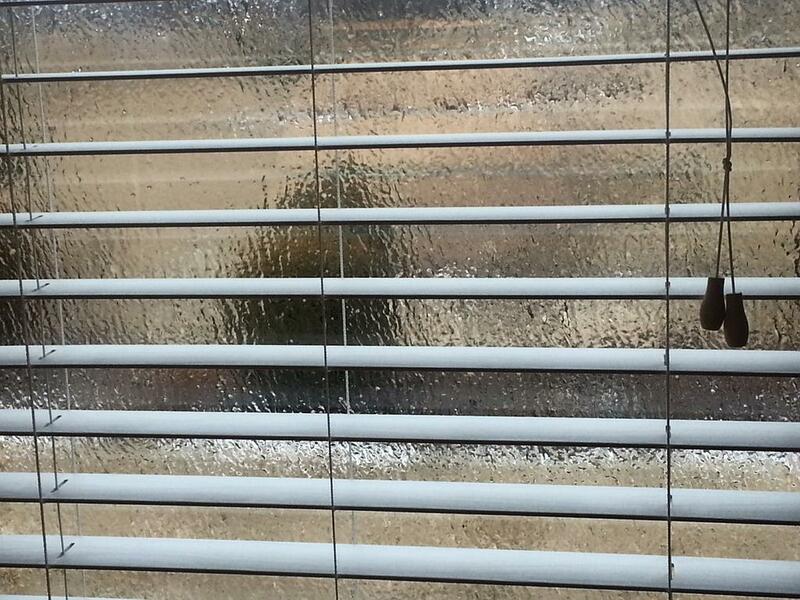 Accumulating ice on things like power lines could also cause power outages if the ice gets heavy enough. If you have any weekend plans, either do them on Saturday or wait until next week to do them. Regardless of whether we get ice or not, Sunday is looking to be pretty messy. Stay safe! A Winter Storm Watch has been issued for all of southern Wisconsin and northern Illinois beginning Sunday morning and lasting through Sunday night. ...WINTRY MIX OF PRECIPITATION EXPECTED FROM SUNDAY MORNING THROUGH SUNDAY NIGHT... A WINTRY MIX OF SLEET...SNOW AND FREEZING WILL DEVELOP OVER NORTH CENTRAL ILLINOIS SUNDAY MORNING AND THEN SPREAD ACROSS THE REST OF NORTHERN ILLINOIS AND NORTHWEST INDIANA...INCLUDING THE CHICAGO METRO AREA...SUNDAY AFTERNOON. SURFACE TEMPERATURES ARE EXPECTED TO INITIALLY BE IN THE UPPER 20S BUT WILL GRADUALLY WARM INTO THE LOWER 30S SUNDAY AFTERNOON AND EVENTUALLY INTO THE MIDDLE 30S SUNDAY NIGHT. SOME SLEET AND ICE ACCUMULATION WILL BE POSSIBLE BEFORE THE PRECIPITATION TRANSITIONS TO ALL LIQUID RAIN. BUT AT THIS TIME...IT IS TOO DIFFICULT TO DETERMINE SPECIFIC AMOUNTS... GIVEN THE UNCERTAINTY OF HOW FAST SURFACE TEMPERATURES WILL WARM ABOVE FREEZING. ANYONE WITH TRAVEL PLANS SUNDAY MORNING THROUGH SUNDAY NIGHT SHOULD CONTINUE TO MONITOR LATER FORECASTS FOR THIS POTENTIAL WINTRY MIX OF PRECIPITATION. TRAVEL IS EXPECTED...ESPECIALLY SUNDAY AFTERNOON AND NIGHT. SOUTHEAST AND FAR SOUTHERN WISCONSIN TOWARD MONDAY MORNING. UPDATES ON THIS HAZARDOUS WEATHER SITUATION. The weather Sunday afternoon may get a little dicey with our next approaching storm system as a mixture of sleet, freezing rain/drizzle and rain are expected to occur all within a 24 hour period. Warm air a few thousand feet above the surface will begin to move in early Sunday morning. This will cause temperatures aloft to warm well above freezing while temperatures at the surface remain right at or slightly below freezing (32°F). Even the little bit of snow we received early Friday morning will help to the cold air lasting longer at the surface until late Sunday when enough warm air advection (push of warm air from the south) helps to overcome the cooler temperatures. With this type of set-up occurring it's possible a period of freezing rain and sleet may occur from late Sunday morning through Sunday evening until surface temperatures rise above freezing. If we do experience a period of freezing rain ice accumulations of up to a quarter of an inch will occur on surfaces such as roads, sidewalks, parking lots, trees and power lines. It's important to note that any little deviation above or below 32°F will have an impact on what happens at the surface. While a significant icing event isn't anticipated at this time roads may become dangerous for travel Sunday afternoon and evening. If you have anything you need to do over the weekend, do it Saturday. Adjustments to the forecast will be made throughout the weekend for Sunday/Sunday night so make sure you continue to check back for the latest updates! 8:30pm Update: The snow has ended but the slick roads will continue. I've heard some reports of rollover accidents on I-90 near Janesville, WI this morning due to black ice. Roads may look just wet but with temperatures below zero a thin layer of ice may form. Light to moderate snow continues to fall early this morning with the heaviest now east of the Rockford area. Accumulations will remain light but a dusting up to an inch, or slightly more, will be likely across the region. The snow quickly accumulated on roads this morning so a few slick spots will be possible for your morning commute. Drive safely! Where the snow is a little more moderate, visibility has gone down near Rochelle, DeKalb and closer to Chicago. Visibility is expected to improve by mid-morning. The blue on the map represents temps below the freezing mark, so it hasn't just been the Stateline dealing with bitter cold air this week, but most of the country. As for the Stateline's cold snap, our high this week was 21° on Wednesday with a low of -3° Tuesday morning. Highs are expected to stay in the 20s for Friday and Saturday before finally warming up into next week. It's another cold morning in northern Illinois and southern Wisconsin. Cloud cover from Wednesday evening cleared out just enough to allow temperatures to fall into the low single digits. Winds have been fairly gusty from the north/northwest this morning dropping wind chills as low as -18°. Winds will lighten up some during the afternoon but the increasing cloud cover will halt temperatures from rising much past the mid and upper teens today. A fast moving storm system will move in late tonight and early Friday morning. Moisture will remain limited, however, with such a dry and cold atmosphere in place any snow that does fall will have a high snow to liquid ratio allowing for a fluffy 1"-2" area wide - maybe up to 3" but totals shouldn't rise much past that. The snow will fall after 10pm tonight and last through your Friday morning commute. Clouds will stick around through the afternoon with some light snow or flurries lingering into the afternoon. Temperatures drop once again Friday night with wind chills by Saturday morning dipping below zero. Another, more significant, system will impact us Sunday through early next week with a mixture of snow, sleet, freezing rain and rain. Details on that storm will be coming up in another post. Stay tuned! 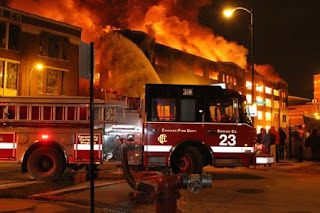 If you didn't hear the news, there was a 5-11 alarm fire in Chicago's Bridgeport neighborhood (south of downtown) Tuesday night. There are several interesting weather angles that can be taken from this story. First, here's a shot of the fire as it was happening Tuesday night. As you can see, this was a serious situation. According to reports, about one-third of all Chicago firefighters were on the scene to help put out the fire at one point. 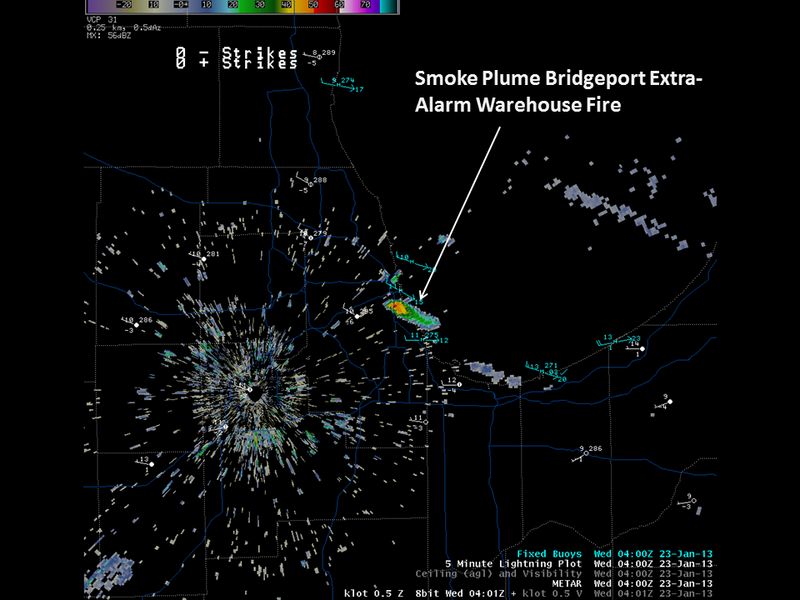 Even if you weren't in the area, you could still see the fire if you checked out Chicago's NWS radar. You can actually see northwest winds carrying the plume of smoke out over Lake Michigan! Let's fast forward to Wednesday. 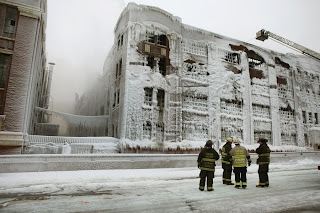 The fire is out, but with these bitter cold temperatures, all the water used to battle the flames how now turned to warehouse into an ice palace. Check it out! Winds of change coming and they're coming fast! 2012: Warmest Year On Record for the U.S. It's cold today but it may not last!